As Giotto said, Rome is the city of echoes and illusions, where the present architecture is a memento of an invisible past and where its millennial stratification lied down layers of voices, feelings, and intangible matter. The more appropriate way to approach the eternal city seems then not seeing it, not touching it, but rather sensing it, absorbing its input and capturing its essence. During this class students will transform themselves into recording devices, able to experience the environment and simultaneously becoming physical representation of their surroundings. Aim of the class is to provide a creative learning environment in which cultural and technical exploration goes hand in hand. Students will be invited to observe and listen at the external environment and responding to it with interactive solutions. The class strongly promotes an interdisciplinary approach introducing to students multiple tools belonging to various disciplines, from research to electronics, to wearable till performances and video narratives. This workshop will address the following questions: What is the narrative of an urban space as constructed through environmental data? How can environmental data be represented in a narrative form through visual and auditory abstraction? The outcome of this workshop will be a visual and auditory narrative abstraction, representing the urban space of Johannesburg, South Africa. The workshop introduces participants to open-source hardware and software - including digital/analog sensors and micrcontrollers, in the augmentation and mediation of the physical, tangible environment. The workshop includes a brief introduction to the Arduino Development Environment, its capabilities and limitations, as well as provide an opportunity experience the process hands-on. Participants will produce a small interactive device that responds and interacts with the environment. This workshop, conducted by Diane Derr, Peter Baldes and Bob Kaputof, targets artists and designers interested in the expansive field of the moving image, and the integration of time-based media and interactivity. Participants will learn and practice: basics of video production and shooting panoramic video on location; basics of editing in Apple’s Final Cut Pro, including sequencing, voice-overs, audio mixing, compression, etc. ; system design; data distribution methods for multiple devices; and live, collaborative interaction techniques. 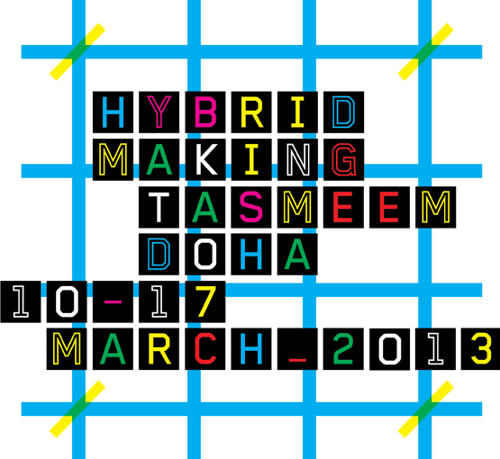 Background: Integrating the themes of “Hybrid-Making” and “Made in Doha,” this workshop links traditional video production with performative and collaborative interactive practices. The workshop will be divided into five components: video shooting, video editing, database configuration, system design (performance rules), and an interactive exhibition installation.